One of the disadvantages of the bushcrafters who want to make their camp out of available materials in the wilderness is that they have to carry such heavy packs. Of course they need a huge survival knife, to fight bears and ...well, I am sure that they find uses for those knives. The only thing we've every seen someone use a big knife for on the trail is to split wood, scrape wood for tinder, or dig a hole for a tent stake. In each case, we had to smile. We never make fires with wood big enough to split, because they take too long to put out properly. * And with a good lighter and a little bit of paper, we don't need to create piles of tinder for our bow-drill. And we can't think of a better way to ruin your knife that to use it to dig a hole, or pound in a tent stake. What's more, we've sometimes seen everything from a hatcherTto a shovel tied to a pack...as if the hiker is going to homestead somewhere out by the lake. What a lot of extra weight to carry for no purpose! We take along a small plastic trowel as part of our toilet kit, but we don't need to dig a latrine, just a small cat-hole. The hatchet? The only thing a hatchet can do in the wilderness is leave marks wherever it is used--which is exactly the opposite of our philosophy to leave no trace. We leave no trace...and we leave the hatchet at home. The barely legible sign in the photo is on the Mokelumne River...and suggests that you please leave things the way you find them. 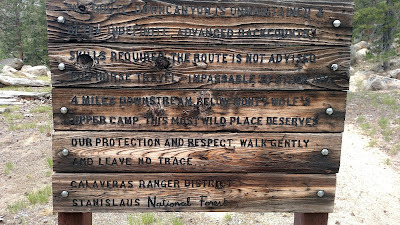 Good advice throughout the Sierra!